Beneficiaries (Patients): Click here to learn details about benefits offered in 2017 that are no longer available. Participants (Health Care Providers): Click here to learn about changes in quality performance reporting and use of NGACO waivers, including the 3-day Skilled Nursing Facility Rule Waiver, Post-Discharge Home Visits, or Telehealth Expansion, which are no longer available. Preferred Providers (Hospitals, Affiliate Providers, Skilled Nursing Facilities): Click here for information about about use of NGACO waivers, including the 3-day Skilled Nursing Facility Rule Waiver, Post-Discharge Home Visits, or Telehealth Expansion, which are no longer available. KentuckyOne Health Partners, LLC (KYOne HP) has been accepted into the CMS Next Generation Model Accountable Care Organization (ACO). A Next Generation Accountable Care Organization is an ACO Model implemented by CMS. ACOs are groups of doctors, hospitals and other health care providers that come together to provide coordinated, high quality care to their Medicare Fee-for-Service patients. Coordinated care helps ensure patients, especially the chronically ill or those who are hospitalized, get the right care at the right time, and avoid unneeded duplication of services such as lab tests and x-rays. The Next Generation ACO Model offers different methodologies and financial arrangements with higher levels of risk and reward than other Medicare ACO initiatives. Please visit www.medicare.gov/acos.html or call 1-800-MEDICARE (1-800-633-4227) (TTY users should call 1-877-486-2048) for questions or additional information about Next Generation Accountable Care Organizations. For general information about ACOs for people with Medicare, please view these frequently asked questions. 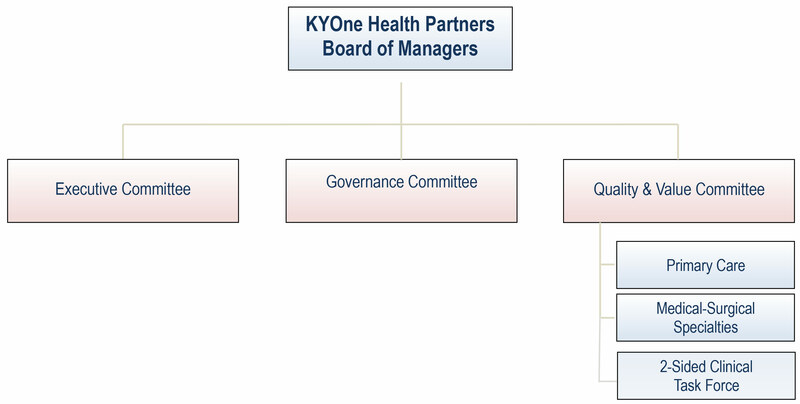 KentuckyOne Health Partners, LLC was formed by KentuckyOne Health. The proportion of shared savings to be invested in infrastructure depends on the amount of shared savings received. Currently, the distribution policy covers operating expenses for the ACO along with a portion for infrastructure with distribution across membership for the remaining funds. The current Next Generation Participants receive incentives for completing work designed to achieve improvement in patient experience, quality performance, and total cost of care reduction. Disclaimer: The statements contained in this document are solely those of the authors and do not necessarily reflect the views or policies of CMS. The authors assume responsibility for the accuracy and completeness of the information contained herein.